The first Danish study into how one of the worlds largest wind farms affects marine life is now completed. It shows that the wind turbines and the fish live quite happily together. Indeed some species of fish have actually increased in number. As work is just beginning on Denmark’s newest and so far largest offshore wind farm off the island of Anholt, comes some hopefully good news for all fish in the area. A new report from the Danish wind-park Horns Rev 1, one of the world’s largest offshore wind farms, shows that offshore wind farms and fish can live together in harmony. The 80 huge turbines at Horns Rev 1 are located just off Denmark’s westernmost point and will be celebrating their tenth birthday in just over a year’s time. 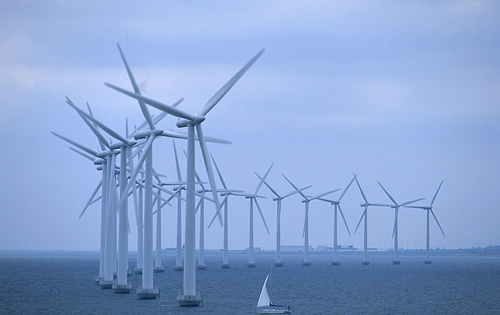 Like other offshore wind farms, it is located in relatively shallow water, no more than 20 meters deep, and thus in an area which is typically teeming with fish. Even before the park was built, researchers from DTU Aqua, National Institute of Aquatic Resources in Denmark, sailed out to conduct a survey of fish life in the area. Biologists then compared the data gathered at that time with the situation in the area seven years after the wind turbine blades began to turn. “Our study showed that the turbines have not adversely affected fish life in the area,” says biologist Claus Stenberg from DTU Aqua. Offshore turbines at Horns Rev are sunk deep into the seabed and surrounded by a rim of large piles of stones, which prevents the sea currents eroding deep trenches in the sand around the turbines. The study suggests that these stone structures also act as artificial reefs, providing enhanced conditions for fish, with an abundant supply of food and shelter from the current, and attracts fish which like a rocky sea bottom. As such, the turbines have created habitats for a number of new species in the area. “Species such as the goldsinny-wrasse, eelpout and lumpfish which like reef environments have established themselves on the new reefs in the area – the closer we came to each turbine foundation, the more species we found,” says Claus Stenberg. The researchers were keen to see how the fish species that live on the large fine-grained sand banks that the mills were constructed on would be affected – species that include, for example, the sand eel, which is one of the most important fish for the Danish fishing industry. “The study shows that wind farms have not been a threat nor of particular benefit to the sand eel. The sand eel is dependent on the fine sand, in which it buries, to live, and the mills did not affect either the sand grain size on the bottom nor had any impact on the number of sand eels,” the DTU Aqua biologist concludes. Since the Horns Rev 1 was built, the area has been closed to all fishing activities. As a result, thepark has become a kind of mini protected area, although it has been too small to have had any significantly positive effects on local fish stocks. “Our studies suggest that the Horns Rev 1 is too small to function as a true marine protected area (MPA), because over their lifecycles the fish utilize a much greater area than just the wind farm. But presumably several parks located close to one another could have a combined positive effect on spawning and the survival of fish fry, as wind farms which are located downstream of each other can act as a kind of dispersion corridor for eggs and larvae,” says Claus Stenberg. The study of wind farm Horns Rev 1’s effect on fish life was carried out as a joint project between DTU Aqua, Orbicon, DHI and NaturFocus. The project was led by Orbicon with DTU Aqua responsible for the practical and experimental analyses. Great pictures of our work.